Oncologists in France are exploring the use of bidirectional chemotherapy as a pre-operative tool for peritoneal mesothelioma, increasing the eligibility of patients for aggressive surgery. Their bidirectional chemotherapy — which typically includes a pemetrexed (Alimta) and cisplatin combination — is delivered directly into the abdominal cavity to reduce tumor burden and make cytoreductive surgery more manageable. Doctors at Gustave Roussy, one of Europe’s premier cancer centers, documented this novel use in a study published in the November issue of Annals of Surgical Oncology. 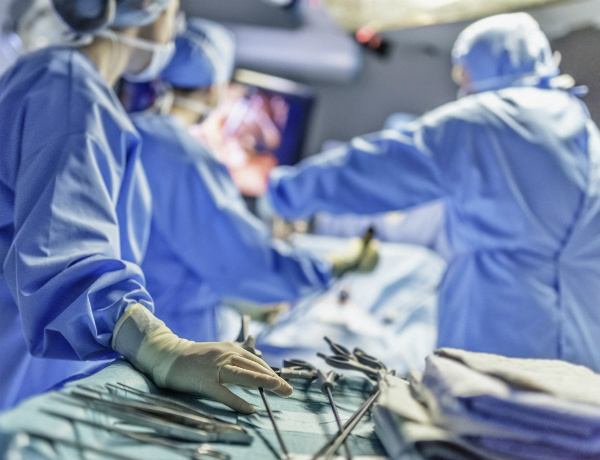 According to the study, half of the previously unresectable or borderline cases became eligible for surgery after bidirectional chemotherapy, which led to a longer overall median survival. A combination of cytoreductive surgery and hyperthermic intraperitoneal chemotherapy (HIPEC) has become the optimal treatment for peritoneal mesothelioma, lifting median survival rates to more than five years. The problem, though, is the majority of patients diagnosed with peritoneal mesothelioma are not eligible for surgery, typically because of tumor spread (metastasis) or overall health issues that would make it counterproductive. Without surgery, patients receive only palliative intravenous chemotherapy, which has been relatively ineffective, producing a five-year survival rate of 10 percent, according to the study. The French study notes bidirectional chemotherapy has improved the outcome for patients with borderline resectability and allowed patients with previously unresectable status to undergo surgery. The study began with 20 patients who either were borderline resectable (12) or unresectable (8). After bidirectional chemotherapy, nine of the borderline and two of the unresectable patients qualified for a complete resection and HIPEC. The survival rate for the entire cohort at one and two years was 83.1 percent and 65.8 percent, respectively. Additionally, the overall survival rate at two years was 83 percent for those getting surgery and HIPEC, compared to just 44.4 percent for patients who had only the bidirectional chemotherapy. The median disease-free survival for those having surgery was 25.5 months. Four of the nine who had only the bidirectional chemotherapy died within 14 months. Bidirectional chemotherapy has been used successfully with ovarian cancer, although it is not universally accepted. Dr. Paul Sugarbaker at the Washington Cancer Institute pioneered the use of bidirectional chemotherapy for peritoneal mesothelioma, but using it post-surgery instead of pre-surgery. Sugarbaker published a study in 2012 detailing the effectiveness of adjuvant bidirectional chemotherapy following HIPEC. It was delivered with intraoperative intraperitoneal port placement. Earlier this year, Sugarbaker published another report in the European Journal of Surgical Oncology detailing a similar procedure that produced a five-year survival rate of almost 75 percent. In addition to HIPEC, his patients received normothermic intraperitoneal chemotherapy (NIPEC) and early post-operative intraperitoneal chemotherapy (EPIC).